Yuriy Lutsenko: Sytnyk is seeking "personal immunity by launching proceedings against all the others." Prosecutor-General Yuriy Lutsenko has expressed concern over the recent actions of the director of the National Anticorruption Bureau of Ukraine (NABU), Artem Sytnyk. 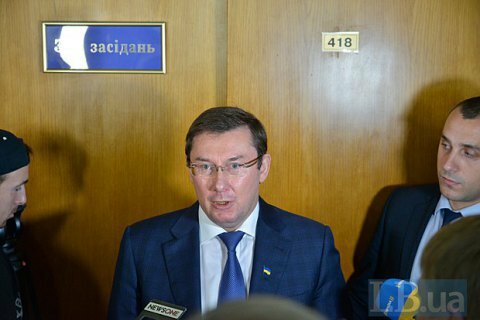 "I am deeply concerned about the situation when the head of a law-enforcement or anticorruption agency issues an absolutely legal request to be provided with documents while another one refuses to do that and at the same time brings a case against the former who dared to ask him for something," Lutsenko told a briefing on Friday, 17 November. "And then comes reaction from the supervisory body, the SAPO (Special Anticorruption Prosecutor's Office), which says that there is a clear conflict of interest. The NABU head, in turn, reacts by saying words that are not quite suitable for public use. I think this is destabilization of the coordinated work of the law-enforcement system," the chief prosecutor went on. Lutsenko said that Sytnyk is seeking "personal immunity by initiating proceedings against all the others" and expressed hope that parliament's anticorruption and law-enforcement committees will look into the situation. The chief prosecutor stressed that law-enforcement agencies have a common enemy, which is crime, so internal squabbles make no sense. In early November, the Anticorruption Agency drew a corruption report for Sytnyk after he allegedly issued a power of attorney to the head of the NABU law department to represent his interests in court. Thus, according to the agency, the NABU chief used government resources for personal purposes. On 13 November, Sytnyk said that the government was trying to block the NABU's high-profile anticorruption cases.